Introducing Chatbot Integrations - Higher Revenue, Better Engagement! Introducing Chatbot Integrations – Higher Revenue, Better Engagement! Improved Customer Engagement. Chatbots help you build custom interactions with shoppers to provide personalized shopping tips based on their unique history. Marketing Funnel Guidance. Chatbots guide leads through every step of the sales funnel and address each question as it comes up. Relevant Notifications. Chatbots can predict customer behavior and push the right notifications to the right people at the right time. Broadened Reach. Chatbots can maintain unlimited contacts. Humans can’t do that. Heighten Brand Value. Chatbots can remember everything and analyze it all. And then use the info effectively to communicate your brand to the right people in the best way. The ChatBot element requires a Growth Plan. Already an OptinMonster customer? Upgrade here! Otherwise, click here to get started with OptinMonster today. 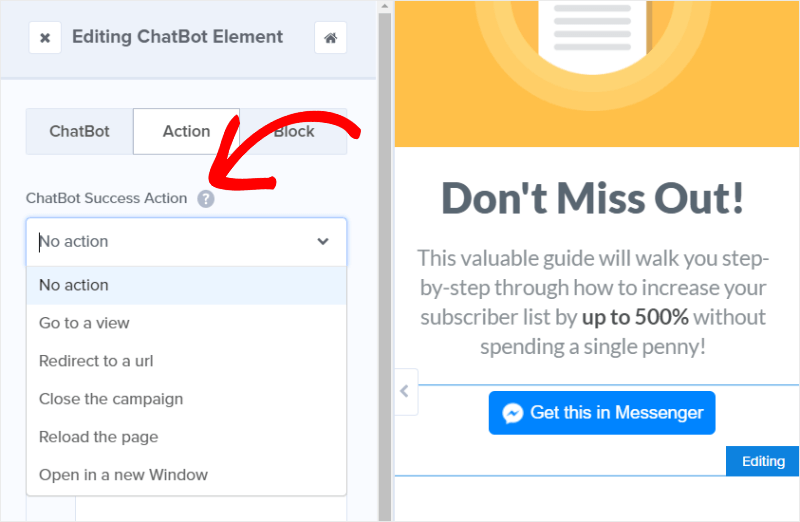 With this new ChatBot element, you just drag and drop the block into your campaign, connect it to your ManyChat account, and your Messenger marketing is up and running! The new ChatBot element is so exciting because it gives you a new way to connect with your visitors. 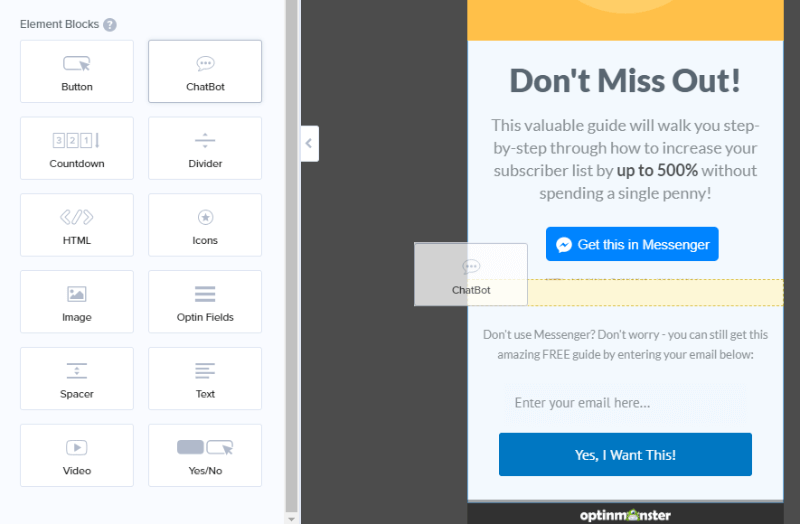 Plus, you can include both Messenger and email optins in your OptinMonster campaign. That makes it super easy to reach users who enjoy getting marketing through Messenger instead of email or vice versa. The default setup for the ChatBot element uses ManyChat’s actions, but you can use your own, too. Like other OptinMonster elements, the ChatBot element has several actions available. And, you can also trigger success scripts! Facebook messenger offers you an alternative to gated content that is then delivered via email to users who opt in. Instead of asking users to fill out a form to receive content via email, you can give them the option to skip the form and get the content via Facebook messenger. In addition to content delivery, messenger marketing can also be used for lead generation. For one of their events, HubSpot asked attendees to confirm attendance inside Messenger and then sent automated messages to those confirmed on behalf of their local sales rep. The message included a HubSpot tool that allowed users to link to the rep’s calendar in case they wanted to set up an onsite meeting. Aside from being accessible to customers at a moment’s notice, there are other ways to use messenger for customer support and feedback. HubSpot was able to get a higher feedback rate from messenger users versus email users when asking for feedback after an event, despite the messaging being the same for both sets of users. Create your chatbot today only with an OptinMonster Growth Plan – click here to get started or click here to upgrade. In addition to ChatBot elements, Project Delight is on a roll, making OptinMonster better, stronger, and more delightful to use every single day. 😍 Be sure to check out the original Project Delight announcement if you haven’t already. When you add a name field to your optin form it now defaults to the top of your optin. But, hey, if you want to ask for the email first, you can still totally do that. The other columns adjust dynamically and you can see the width of the column as you’re adjusting, giving you precise control. Now when you click on an element in live preview, you’re automatically taken to the field’s editing area. If that field has placeholder text (name, email, phone), you’ll go straight to that editing area with the placeholder input focused. Now when you edit an element that has a different look when you hover a mouse over it (like a button), you’ll always see the element in hover state if you’re editing that state. Coming Soon to an OptinMonster Near You… Mobile Campaigns! We know you’re as excited about everything that’s going on with OptinMonster as we are and we can’t wait to bring you even more. 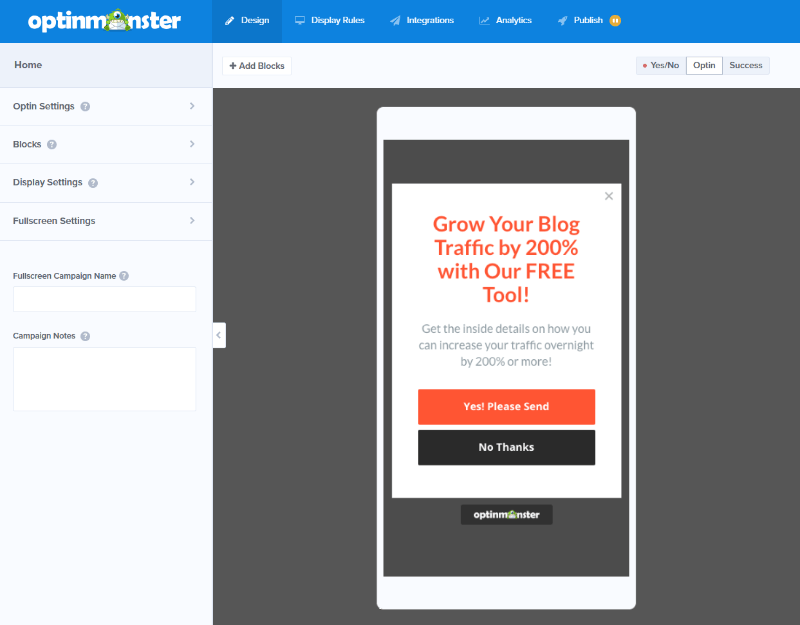 In the meantime, get your OptinMonster Growth Plan and kickstart your Messenger marketing – sign up for OptinMonster or click here to upgrade.